The Silent Brainstorm technique has been used since the 60's when it was designed by Jiro Kawakita, an exceptionally talented process engineer. We've adapted it for the modern world of realtime online interaction, and I'm sure Dr Jiro would be impressed. If you want to get the most out of this ingenious technique, follow our recipe for success. 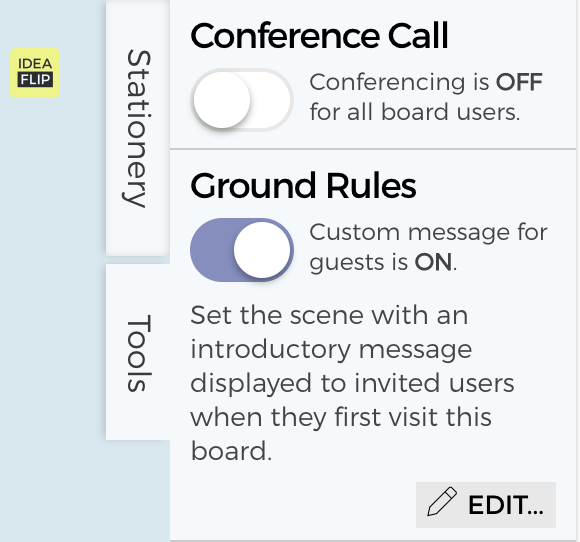 Invite members of your team to a new board. Change the title of the whiteboard in the admin settings and maybe add a note or text to the board with your draft issue statement. You can invite your team by either adding them via the invite page, or sharing the appropriate board URL to an email, slack channel or other preferred communication tool. There are 4 different levels - as the board owner you can select what access other participants have. Contributors can add or delete their own notes, or move others notes around. Views can only see changes to the board. When you're in a session, you can also lock the board to stop people playing with things while you're explaining something. Click on the tools panel at the side and flick the Lock Board switch. If you have facilitated a group before, you'll understand the importance of ground rules. You can add these in the Tools panel, so that they pop up when your participants arrive. Once everyone is together, make any necessary introductions and outline the reasons for the brainstorm. Explain the structure and timings (as described below) of the process so that everyone understands. Particularly highlight the importance of maintaining silence during the silent phases and encourage people to add new ideas at any time! Ask them to suspend their opinions and judgements about the process and just try it! If they want to comment, there will be an opportunity to provide feedback and discuss it afterwards. Start by creating a draft statement of the problem or issue that the brainstorm is about. Be specific about the purpose of the brainstorm, but avoid limiting the outcomes by using restrictive language. We've built a timer into the Tools panel, so you can set a countdown for your team to see how long they've got. Everyone starts to add their ideas to the whiteboard, using one sticky note per idea. Try to avoid single words, but keep sentences short. Break sentences with the word 'and' into two or more notes. Depending on how you prefer to work, team members can stick to using just one colour for their notes, or any colour. Keep going until the ideas stop coming! You may decide to set a time limit to help focus minds - you can always shorten or lengthen it if you need to. Start by spreading all the stickies around randomly, so all ideas can be seen. Then, in silence, everybody start to move related ideas into groups. If it looks like a card belongs in two groups, duplicate it (you can do this with the copier icon that appears when you start dragging). Remember that anyone can (and should) add new thoughts as they occur. When everyone is satisfied with the groups, move on to the next stage. Starting with the easiest group, discuss the central theme and add a sticky note with a heading that captures the meaning of that cluster. The group headings should be specific and consistent. If clusters need to combined or broken up, feel free to rearrange into new groupings. If a satisfactory heading can't be found then park the discussion and move on to a different group until later. Take care of any stragglers - these can be dropped, added to an existing cluster or given a heading by itself. The results of the brainstorm (the headings) can be used for further investigation or development of a plan, depending on the nature of the brainstorm topic. Thank everyone for taking part! Click on the PDF link to download the results. You can tidy up the groups of stickies by arranging them in columns under each heading with a box around each cluster, if you wish. Email the PDF to the team and invite comments and feedback on how to improve the process for next time.